Parts 1 and 2. Introduction to Sanskrit, in two volumes is designed to open the seld-teaching guide presents Sanskrit pronunciation, grammar and vocabulary in simple and systematic steps, allowing students to easily master the fundamentals of this enchanting language. The text gently leads the beginner through samll steps with clear, concise explanations. Each lesson includes instruction in alphabet, grammar, and vocabulary, with easy practice exercises at the end. This self-teaching guide presents Sanskrit pronunciations, grammar, and vocabulary in simple and systematic steps, allowing students to easily master the fundamentals of this enchanting language. The text gently leads the beginner through small steps with clear, concise, explanations. Each lesson includes instruction in alphabet, grammar, and vocabulary, with easy practice exercises at the end. Also included is a reading from Bhagavad-Gita and Sanskrit quotations from the Rk Samhita, Upanisads, Yoga Sutras, Brahma Sutra, and Manu Smrti. Part Two uses verses from the Bhagavad Gita to teach principles of grammar, and includes additional essays on Sanskrit pronunciation and grammar. 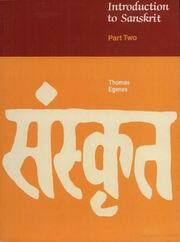 A superb book for beginning with Sanskrit taking one through the basics of reading and writing and also the basic grammer. The book has a lightness to it and it has beautiful quotes from various texts, the quotes are especially touching and very poetic. The book is nicely structured and the author has truly mastered the subject and writes from a conscious perspective.